Typically, a rechargeable battery pack has less than 1000 recharging cycles before significant degradation observed on its battery life performance. 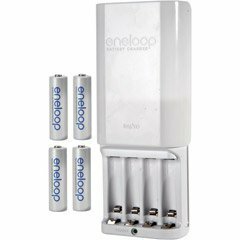 As a continuous effort to improve its durability battery cells due to more stringent requirement from consumers, Sanyo has just released a high performance ‘eneloop’ rechargeable AA and AAA battery cells that can be recharged up to 1500 times suitable for various usages. Being designed in standard AA and AAA types, the new battery cell has been improved in terms of new material and manufacturing technology that able to boost up its performance up to 1.5 times as compared to its predecessor that can be recharged up to 1000 times. Besides, it is able to sustain its capacity with no self-discharge issue that being experienced by other makers’ products which actually means the battery can last longer with negligible leakage current even though it has not been utilized for longer period. A new battery in storage condition for one year is claimed to be able to sustain 85 percent of its original capacity and hence consumers can use them immediately without the need of recharging for the first time when purchased from shelves. Some other advantages include minimum memory effect, an antibacterial sealed labeling and many more that makes it more durable as compared to other solutions from its competitors. The product is already available now and the Japanese cell battery maker even promises to develop a much more powerful battery cell with ability to recharge more than 2000 times in short future.